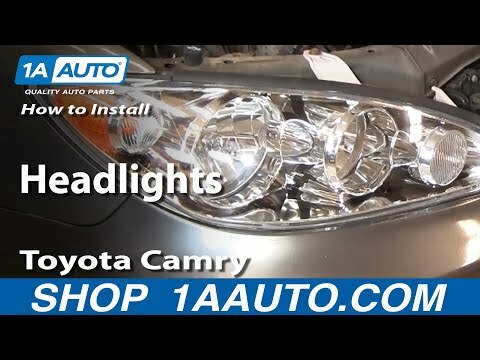 Got a burned out headlight on your 2002-06 Toyota Camry? Do you have a cloudy lens you want to change out? Replace it quickly and easily by following these instructions. Have a cloudy headlight or a burned out bulb, here are some instructions on how to take care of these issues. Before you begin, make sure you get a high quality replacement parts. You will also need a socket set, and flat screwdriver Next, you will want to turn off the car and make sure it is cooled off. Find the bulb located behind the lens assembly and disconnect the wiring harness from the socket holding the bulb by pushing in the tabs and pull it straight out. Twist the socket counterclockwise to pull it out of the assembly. Lastly, remove the bulb by pushing down on the socket retaining clip. Then, insert the new bulb, twist it back into place and then reconnect the wiring harness. Locate the headlight assembly you want to replace. Find and remove three 10 mm bolts located along the top and on the sides on the bumper. Remove the clip on the bumper cover (near the center between the headlights). Under the wheel well, there are two clips you will need to remove as well. Pull the fender out of the way to find another 10 mm bolt. Carefully, pull the bumper cover out and away from the headlight. You will find another 10 mm bolt. Shake the headlight assembly and carefully pry the assembly out by popping it out. Disconnect the power going to the bulbs and the headlight assembly will be ready to remove. Reverse these instructions to put in new headlight assembly. Remember if at any point you don’t feel comfortable taking this issue on yourself, check with your local Toyota dealership for assistance.